I am also submitting this for The Crafter’s Cafe Challenge #6: Christmas in July – Non-Traditional Colors, Stampin with the Dragon Christmas in July Challenge, and Creatalicious Challenges: Christmas in July. The photo reminded me of the Tinsel Christmas Tree we had when I was growing up. 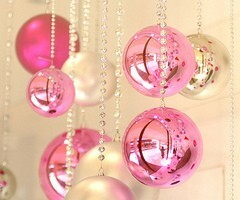 One year , my mom decorated the whole tree in pink, white and silver ornaments. And that reminded me of the little translucent bubbles that were all the rage a few years back. I still have several colors of them in jars on my shelf, so I grabbed the pink ones and went to work. At first I was going to use Stampin’ Up! Snow Swirled for my tree, but then I remembered the Memory Box Winterland Tree Die and decided to try that instead. I used Stampin’ Up! Brushed Silver for the tree, glued it to a piece of Stampin’ Up! Shimmery White Cardstock, matted in Brushed Silver and used glue dots to adhere the bubble ornaments. I embossed a piece of Blushing Bride for the background and sponged it with Raspberry Ripple. I stamped the sentiment in Raspberry Ripple, punched with the Stampin’ Up! Lg Oval Punch and matted with the Stampin’ Up! Scallop Oval punched in Raspberry Ripple. I mounted the sentiment on a piece of Stampin’ Up! Basic Gray Taffeta Ribbon and attached it all to the Raspberry Ripple card base. I think it is a pretty good representation of that old tinsel tree! Happy 4th of July! I was able to sneak in the studio today to finish up a couple of cards, so I’m a happy girl! This card was made for today’s Sketch Challenge SC392 on Splitcoaststampers. This an interesting sketch, it took me a while to figure out what I wanted to do with it. I needed to make an engagement card and wanted to use this pretty flower from Stampin’ Up! Fabulous Florets. In order to make it work for the sketch, I created a mask for the flower and stamped it 5 times in Basic Black on Whisper White to create a bouquet shape that would fit in the Nestabilities Oval die and stamped another flower for the top. I colored the flowers with Stampin’ Up! Markers. I started with the centers, coloring them in Yo Yo Yellow. I colored all the petals in Blush Blossom and then went back over the petals with Cameo Coral, leaving the edges Blush Blossom. I added Calypso Coral about half way up the petals, let it dry for a couple of minutes and then added some feathered lines to the base of the petals. I cut the image with the Nestabilities Oval die and while it was still in the die, I sponged a bit of Calypso Coral around the edges, then matted in Calypso Coral and Kraft. For the vertical layer, I used a piece of scrap designer paper and matted it in Pool Party. 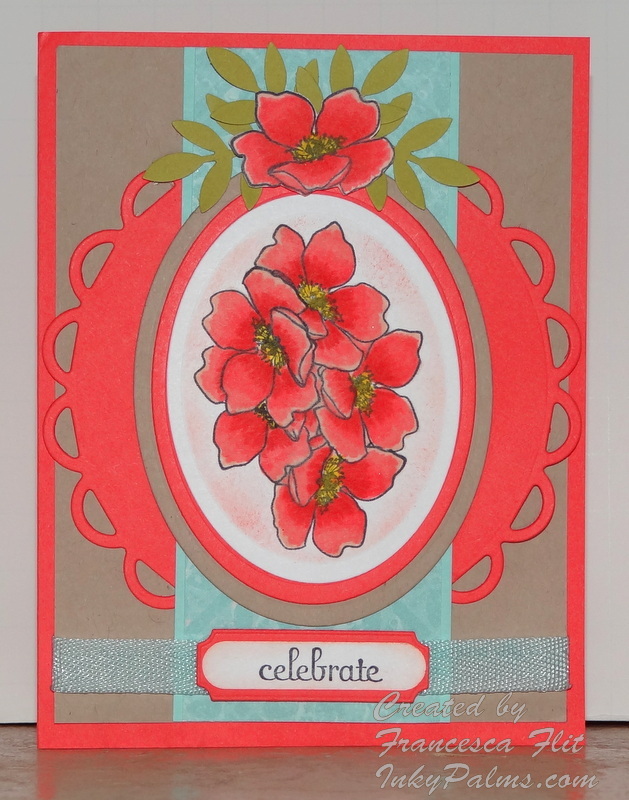 I used Kraft for the background and mounted it to a Calypso Coral card base. I cut the large Nestabilities scalloped circle in Calypso Coral and cut a circle of designer paper to layer on it but decided not to use it in the final design. I stamped the sentiment from Stampin’ Up! Fabulous Phrases in Basic Black, punched with the Stampin’ Up! Word Window Punch, inked the edges with Calypso Coral and matted with a Calypso Coral Memory Box die cut. I mounted the sentiment on a scrap of seam binding and attached under the Kraft background. I punched 4 leaves in Kiwi Kiss with a Martha Stewart punch and glued them to the top of the card. I mounted the cut out flower on top with a Stampin’ Up! Dimensional. 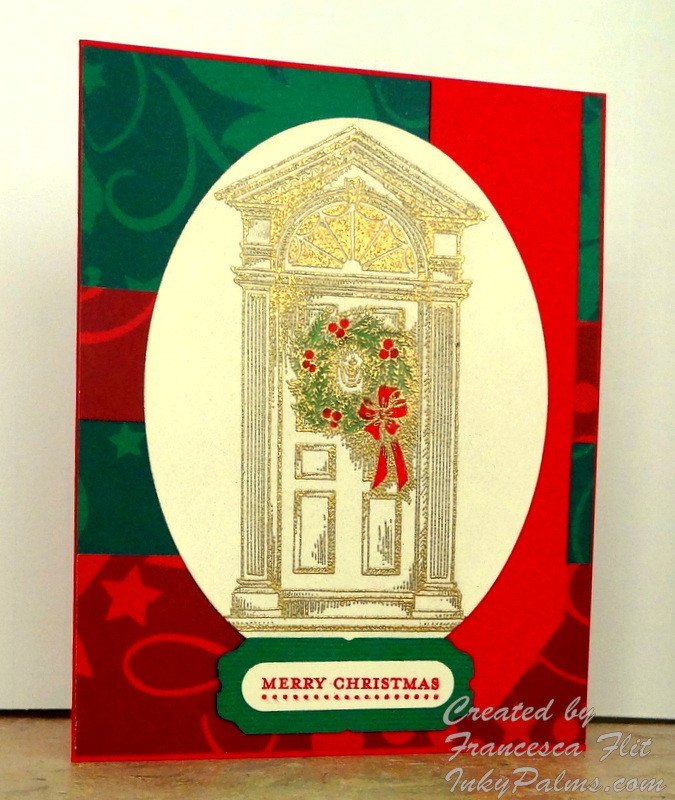 Today’s challenge on Splitcoaststampers is Ways to Use It Challenge Doors & Windows which I combined with yesterday’s Sketch Challenge for my card today. I think this PSX Colonial Christmas stamp is the only door or window stamp I have, but I do love it. I usually stamp it in Brown, but today I decided to emboss it in gold on Very Vanilla cardstock. I used a water brush and Garden Green to color the wreath and a Real Red marker to color the bow and berries. The background papers are scraps from a DCWV Christmas stack that I mounted on a Real Red card base. I cut the banner in Real Red and layered it in top. I stamped the sentiment from Stampin’ Up! Teeny Tiny Wishes in Real Red on Very Vanilla and punched with a Stampin’ Up! Word Window Punch. I cut the mat with the Memory Box Bistro Label Punch and a scrap piece of textured green cardstock. I like this layout but I wish I had gold cardstock to layer under the banner and background panel. Today’s challenge on Splitcoaststampers is the Ways To Use It Challenge WT379 ~ Man up, make a masculine card. I had one more Father’s Day card to make and this gave me the nudge I needed to get it done. 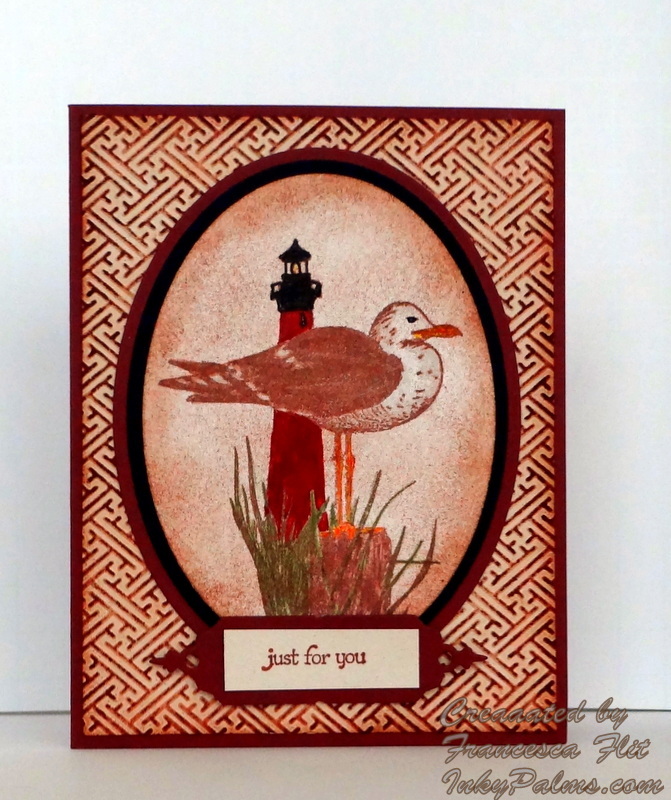 I stamped the Seagull and Lighthouse from Impression Obsession in Versafine Sepia ink on Whisper White cardstock and colored the image with Stampin’ Up! markers. I then cut the image and mats in Basic Black and Bravo Burgundy with Nestabilities Oval dies and used a sponge to pounce Distress Ink in Vintage Photo over the image. For the background, I embossed Stampin’ Up! Naturals Ivory cardstock with the Cuttlebug Embossing Folder Oriental Weave. I used Vintage Photo Distress Ink direct to paper to color the raised portions of the embossed background, sponged with Creamy Caramel and mounted on a Bravo Burgundy card base. I stamped the sentiment from Stampin’ Up! Teeny Tiny Wishes in Vintage Photo Distress Ink on Ivory Naturals cardstock and mounted it on a Memory Box Bistro Label die cut. That’s three masculine cards in a row for me, I am ready for some bright colors! This afternoon I got an email announcing this week’s Paper Players Challenge and I was so excited to the colors, Lucky Limeade, Melon Mambo and Basic Gray. One of my favorite color combos is Old Olive, Rich Razzleberry and Basic Gray, so I could not wait to make a card in this brighter version of my favorite color combo. Today is also the Featured Stamper Challenge on Splicoaststampers and this week’s Featured Stamper is Stephanie aka Booga3. Her gorgeous Snow Bunny card was the inspiration for my layout. 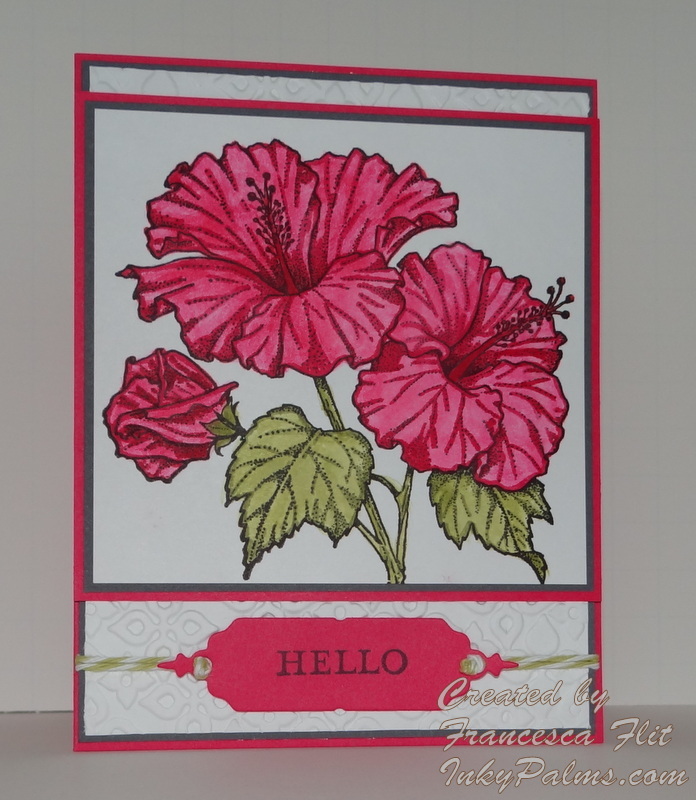 When I pulled out my Melon Mambo, the first thing I thought of was the Hibiscus bush just off my patio that has the most gorgeous bright pink flowers, so I decided to use this Hawaiian Hibiscus by Embossing Arts. I colored the image using ink from the ink pad lid and a water brush, adding the shading with Stampin’ Up! markers. I matted the image in Basic Gray and Melon Mambo. I used Whisper White for the background, embossed with a Sizzix embossing folder, matted in Basic Gray and mounted on a Melon Mambo card base. I stamped the sentiment from Stampin’ Up! Pendant Park in Basic Gray on a Memory Box Bistro Label die cut in Melon Mambo. I tied French Knots in Lucky Limeade Bakers Twine and threaded through the holes in the label. I’m not sure if this is the card I will submit for the challenge, but it was fun to make! Today’s challenge on Splitcoaststampers is an Inspiration Challenge IC339 ~ bibelot. The inspiration site is pretty cool, Bibelot Shops. I chose this pretty Gratitude Journal for my inspiration piece. When I saw it, I immediately thought of the Chloe Die by Memory Box. I used the negative of the die, cut from Stampin’ Up! Peach Parfait and mounted it on a Stampin’ Up! Ivory Naturals card base. The sentiment is from the Stampin’ Up! Mini Note Kit Best of the Bunch, stamped in Whisper White and clear embossed. 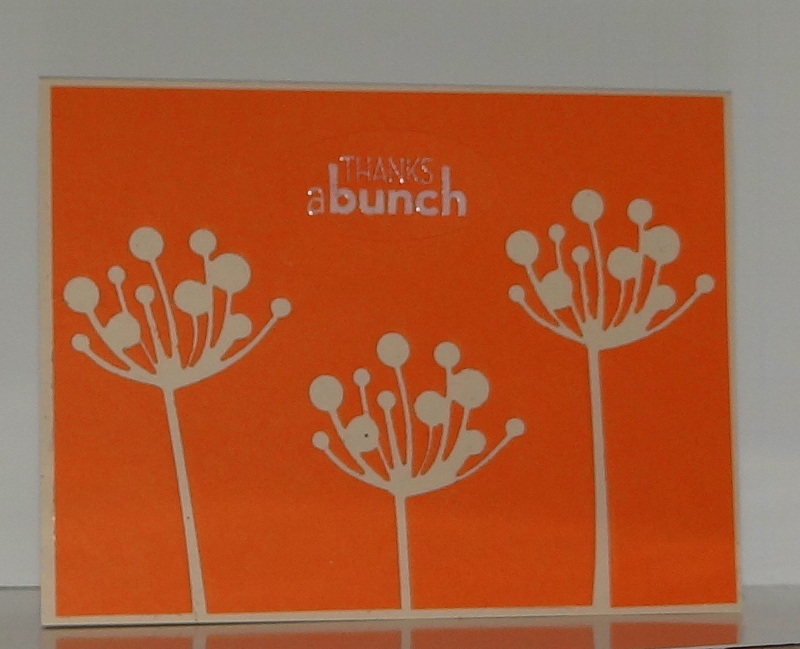 You can just barely see it in the photo, but the sentiment was punched with the Stampin’ Up! Large Oval Punch. My first try at the sentiment was directly on the Peach Parfait, but I smeared the Craft ink. Rather than ditch it, I restamped the sentiment, punched it out and covered my boo-boo! I made today’s card for the Ways to Use it Challenge WT377~ Let’s Get Negative on Splitcoaststampers, to use the negative portion of a die on a card. I chose to use this pretty Chloe Die by Memory box on a black and pink card. I love the whimsical yet elegant feel of this die, and that it is not too intricate made it perfect for this challenge. I cut the die on a piece of Shimmery Pink Paper by DCWV and then cut it with the Nestabilites Oval Die, also cutting a mat in black and in pink. For the black panel, I used an EK Success border punch on the bottom edge and threaded with Stampin’ Up! Taffeta Ribbon. I stamped Stampin’ Up! 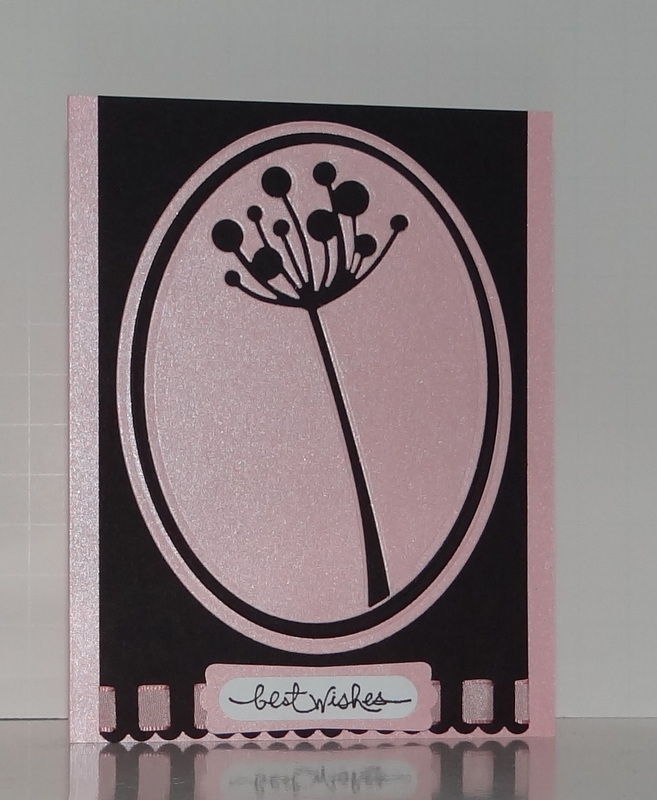 Short & Sweet best wishes sentiment in black on white and punched with the Stampin’ Up! Word Window Punch. I punched the mat in Shimmery Pink with Stampin’ Up! Modern Label Punch. I use this punch combination quite a bit for my sentiments, not too fussy, just a pretty presentation. And I love that Stampin’ Up! has so many sentiments that fit perfectly in the Word Window Punch. My favorite set is Teeny Tiny Wishes, it has such a great variety, something for any occasion. To finish, I mounted the panel on a Shimmery Pink card base. Another CAS card finished for my 100in100 challenge!